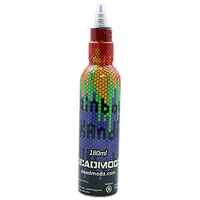 Rainbow Kandi e Juice by Deadmodz put's candy flavored e Juice on a new level. A complex blend of candy and a hint of cream balanced to be an all night fruity and delicious vape treat. Deadmodz was founded in Southern California, hand-crafted in the USA only using the finest food grade and pharmaceutical USP ingredients.